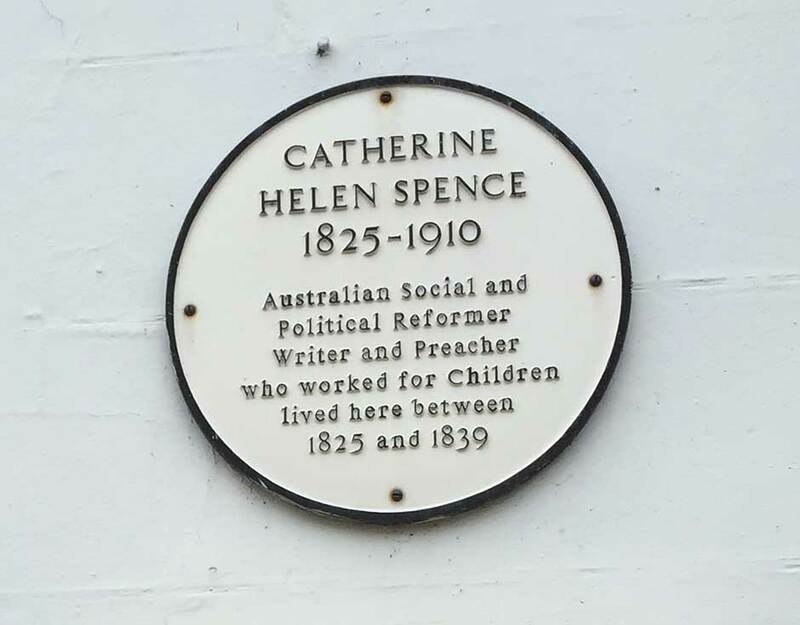 Many of you may have seen the plaque outside the Townhouse “Catherine Helen Spence 1825-1910. Australian Social and Political Reformer Writer and Preacher who worked for Children lived here between 1825 and 1839.” Perhaps you have wondered who she was, what was her story and what were her connections to the Townhouse and of course to Melrose? James and I decided to take a look into her life and what we found was fascinating and we thought we would share it with you. Her Australian story is fairly well known and Catherine is regarded as a leading Australian author, teacher, journalist and campaigner for women’s rights. Catherine emigrated with her family to Adelaide, Australia aged 14 and became a governess. She then turned to journalism before writing her first novel “Clara Morison: A Tale of South Australia” one of 8 novels she wrote. At this stage her lifelong work with children started when she founded the Boarding-Out Society a voluntary organisation which superintended the fostering-out of state dependent children. Her interest and work with children and their education was a central part to her life. Catherine was also very religious and one of her other claims to fame is that she became South Australia’s first woman preacher. Catherine was also very interested in politics and was one of the leading campaigners for the vote for women in Australia, and one of the highlights of her life was witnessing the historic passing of the Constitution Amendment Bill through the Australian Parliament in 1894, giving the vote to the women of South Australia, the first Australian colony to do so. She is also the first women in Australia to run for election, which she did in 1897, when she unsuccessfully ran for the Australian Federal Convention campaigning on the single issue of proportional representation. A remarkable achievement for a woman at this time, which is reflected by the fact that there are numerous memorials to her in Australia, particularly in her home city of Adelaide, her portrait has been on an edition of the Australian five dollar note, and in 1975 the Australia Post honoured her memory in a postage stamp. She was latterly known as “The Grand Old Woman of Australia” – a fitting tribute. But what of her life before she emigrated (when she lived in a building which is now part of the Townhouse Hotel)? We were delighted to find that her sister-in-law, Jeanne F Young, wrote the story of her life which was published by the University of Sydney and the first chapter of this details her early life in Melrose. The chapter begins with the words of Wordsworth who said “The Child is father of the man” as Catherine strongly felt that the basis of what she achieved lay in her childhood in Melrose. The chapter paints a vivid picture of life in Melrose at the time. Highlights include the fact that she lived during the latter part of Sir Walter Scott’s life, and she has vivid memories of his long funeral procession to Dryburgh Abbey. Although she clearly did not agree with his politics, it is evident that she clearly admired what he had achieved and the fact that he placed the Scottish Borders on the literary map. Melrose was also a key place in those days for politics, as Catherine can remember the main square just outside her home (now the Townhouse) being a debating area, and aged nine, enjoying a lively debate when a gentleman from Edinburgh came to speak about reforms, starting her interest in politics even at this young age. We were also intrigued to learn of the history of what is now St Mary’s School, which was then called St Mary’s Convent. It was started as a boarding and day school in Melrose for the education of girls. Catherine attended this school until sadly, due to her father’s financial situation, she had to leave for Australia. But Melrose’s, and arguably Scotland’s loss, was Australia’s gain although we have to ask the question – what would she have achieved here if she had stayed?